Giving thanks and making lists. Two of my favorite activities. Well, that calls for the creation of a new word! Allow me to introduce to you gratituding: making a list of people/things/concepts/etc. for which one is grateful. Below are my top five blessings for 2016. Verbing – using nouns or other parts of speech as verbs. We do this all the time (Google it if you don’t believe me <see what I did there?>). My favorite example of this creative wordplay in 2016 has been adulting. As in: I’m done adulting today. I’m going to change in my pajamas, grab my blankie, and color now. I never realized there was a name for the process, though, before I read Beard Science, by Penny Reid (more on her later). Travel Magic – this is a mindset introduced to me by one of the most optimistic and positive people I’ve ever met. She’s traveled a lot this year and even when the path was onerous (think a writing retreat interrupted by a hurricane and not one, not two, but three evacuations to new lodging), her posts were chock full of blessings because she sees the miracles in ordinary, everyday life and focuses her attention on the bright side. As I travel through life, I’m grateful not only to have my pal as a companion on the road, but the benefit of her philosophy and example as well. 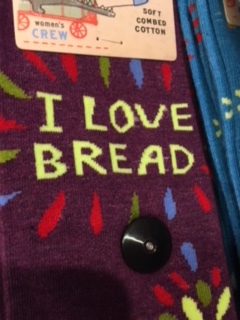 Socks that are right up my alley! mber of several micro-communities that routinely sit down together. We share a meal, we share our lives. We connect over one of the most profound, essential acts of the human condition that doesn’t require the removal of clothing. I could be worst-day-evering <see? fun!>, in a total funk, wanting to cocoon in my condo and shut out the world, but the promise of meal with loved ones–often the family of my heart if not always my blood–carries me through. New To Me Authors – 2016 blessed my bountifully in books by authors I hadn’t yet read. I suspect I could make the whole post about this, but I will show some restraint. My most reliable book-whisperer was our very own Taylor Reynolds, who routinely saved me from deprivation when I ran out of reading material (thank you, girl!). In no particular order, I commend to you: Penny Reid (the Beard series), Kit Rocha (the Beyond series), Kristen Callihan (the rock star series), Thea Harrison (Moonshadow), M. O’Keefe, Rebecca Yarros, and Cara McKenna. Walking – I started 2016 hobbled by an undiagnosed case of psoriatic arthritis. The disease came on fast and spread through my joints in an agonizing take-no-prisoners march, making the simple act of rising from my bed a painful ordeal. As I searched for relief, I walked through the stiffness, connected by Fitbit to a great group of cheerleaders. All these months later, my disease is under control, the pain is mostly at bay, most of the time, and I’m still walking, accompanied by friends near and far. I feel most alive and connected to the universe when I’m walking, most at peace, most hopeful. Retaining the ability to walk, regaining the ability to do it without pain, is a blessing without measure. So, that’s me, gratituding my top five blessings of the past year. What’s on your list? Lovely post, Keely. I second all of your choices. And while I love to walk and especially enjoy taking walks with friends or my husband, I LOVE the gift of technology that allows me to listen to audiobooks while I run. I’m a total luddite when it comes to taking advantage to all a smart phone has to offer, but my phone lets me experience books I’d never have time for otherwise and makes a sometimes onerous activity completely manageable. Happy New Year!